I went to see some ghosts today. My own, to be precise. The last time I was on the Isle of Wight it was also April, but then there was a freak snowstorm that had my parents and I throwing snowballs all afternoon. Today the sun threw silver glints across the water, and it seemed the summer weather had caught the British population unaware. The train was quiet, and I made my way to Portsmouth unmolested by the holiday season masses. This was the first time I visited the Island as a party of one. As I waited for the catamaran boat to take me across the water, I considered what that means. The years of running across the shingle with my bucket and spade are long behind me. Today I travelled as a writer and lone tourist. I had no plan save to walk along the sand and sun myself like a cat. Having just about finished university, I spent today drifting in the strange limbo between being a student and becoming a graduate. I think it’s going to be a languid, hazy summer, but I spent much time today wondering what lies ahead of the interim. Stepping off the catamaran at Ryde, I was greeted by the strip of tourist shops that smell like sand and sugar. 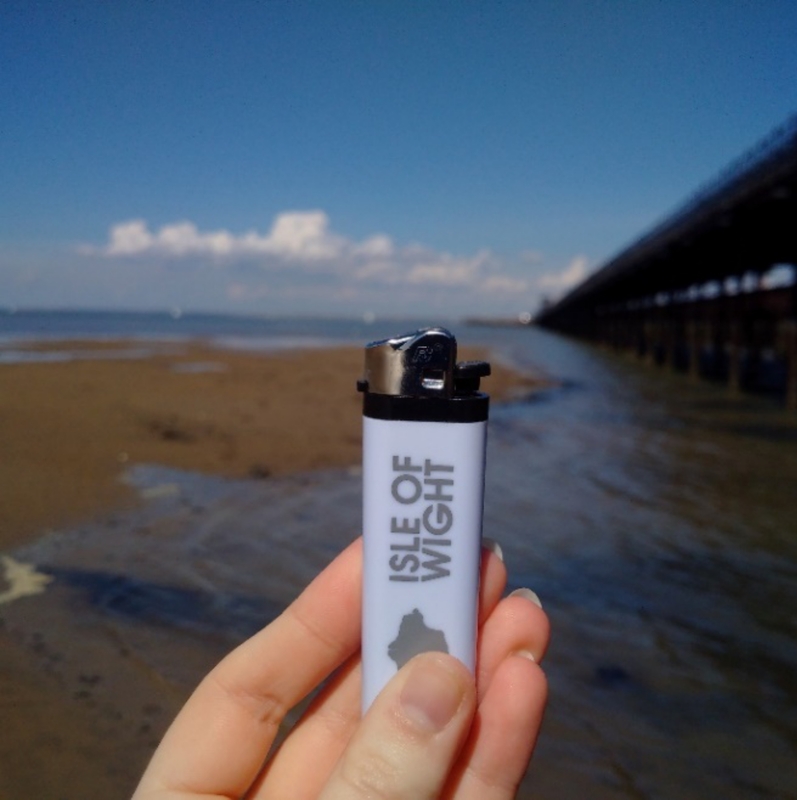 I bought a souvenir lighter from a man wearing an oversized navy hoodie. His face was salt-ravaged, like a fisherman, but he smiled like he meant it. I clicked the lighter as I walked, and people-watched. All the shops and restaurants seemed to be holding their breath, bracing for the deluge of holidaymakers about to descend. There were just a few old couples and the odd family, eating ice-creams and pottering about on the promenade. The beach was quiet. I crossed paths with a dog-walker and two vagrants sitting in the shade beneath the pier, bemoaning the price of tobacco. The air smelt like salt, and I could feel the sea breeze stiffening my hair. I used to visit Ryde every summer as a child. My family and I stayed in a caravan park in the neighbouring village of St. Helens, and we would come to Ryde for the long hill of shops and restaurants. Little has changed since I was ten. Some of the shops had different boards and window displays, selling shells and artsy, hand-painted souvenirs. I passed Beachcomber and Koko’s Bear Shop, and stuck my head in at the local gallery. These places went by other names when I wore jelly sandals, but the spirit of the town was an old, familiar entity. With a little less than 30,000 inhabitants, Ryde is the ‘capital’ of the Island. In 2012, the pier had its 200th anniversary, and the rust gives it the look as well as the certificate. Ryde is a quiet, quaint town, steeped in a lazy, contented mood. Walking up the hill, I found it easy to imagine the same mood hanging in place when the Victorians came holidaying with flannel swimwear and parasols. In true seaside holiday fashion, I had fish and chips for lunch. I sat on the promenade looking out at the water whilst the black-headed gulls screamed on the sand below, as demanding as rude customers in a Friday night bar. Greasy paper in the bin, I remained in the light. The heat stippled the back of my neck. I should have brought sun cream. Today was a contemplative journey into the flickering past, and as I watched the tide draw in I wondered when I will return. My sticky fingers left spots on these pages, and I felt tiny granules of sand prickling beneath my feet. A few minutes later I walked back along the pier for the boat. I took with me my wind-chapped lips and the smell of the coast, and my little lighter; a memento.